Back/When we talk about “assessment,” what do we really mean? When we talk about “assessment,” what do we really mean? When we talk about teachers and classroom data use, we’re oftentimes talking about data produced via assessment, or as Stassen et al. (2001) eloquently write, “the systematic collection and analysis of information to improve student learning.” The word “assessment” can conjure a lot of things for a lot of people, ranging from the high-stakes world of accountability tests to a student’s own reflections on the quality of work they’re producing. The truth is that when teachers, students, and families utilize data to make learning more effective, they navigate a whole constellation of assessment types to understand progress against goals and to make choices on a day-to-day basis. Without specificity and clarity about what we mean when we use different words, conversations can get confusing. So, as a start to an ongoing TLA series around classroom data use, we outline below the assessment cycles we’re observing in today’s classrooms and how teachers attempt to navigate all the data that is produced by students. These assessments can take multiple formats, ranging from computer-produced activity data, to brief written responses, to multiple choice, to authentic demonstration tasks. We’ll talk about how each type, regardless of format, answers distinct questions for practitioners and learners, and we’ll share concrete examples in practice. Diagnostic assessments, typically used at the beginning of the year or a unit to answer the questions “what skills or content has a student already mastered, and where might there be gaps to fill?” Diagnostic assessments can also be used to determine differences in baseline learning given cognitive skill sets. Teachers typically provide a diagnostic assessment to gather baseline data on student understanding. For example, a pre-test at the beginning of the unit gives teachers valuable insight into what students have already mastered, not yet mastered, and any skill deficit that needs to be addressed during the course of the unit. Educators use this baseline information to plan their instruction, create student groups, and provide differentiated and personalized content to meet each student’s needs. Monitoring assessments, which are used continually (either by the teacher or student) to understand how students are progressing against goals or activities. Some teachers have created a system in their classrooms where students can monitor their own progress. This helps students develop an awareness of which concepts they have struggled with or mastered. Self-monitoring is a tool or strategy that educators utilize in classrooms to teach students the important skills of setting goals and managing deadlines. It can also provide teachers an easy way to look at student progress without having to pull data reports from multiple content or assessment tools. Formative assessments, which are used frequently to assess mastery of specific skills or content (regardless of activity). Formative assessments are often used to identify mastery or progress on subsets of skills or mastery of individual learning objectives. When incorporated into classroom practice, they provide the information needed to adjust teaching and learning in real time. There are many types of formative assessments used in classrooms, including but not limited to weekly tests or quizzes, daily “do-nows”, exit tickets, real-time assessments, performance tasks, classroom discussions, presentations, surveys, and more. For example, teachers may continuously monitor students’ progress during teacher-directed/small-group instruction and independent/collaboration practice. Teachers may rely on checks for understanding during instructional time and often adjust or scaffold instruction for students as they progress through learning activities. In blended learning environments, during independent and collaboration time, teachers may rely also on student practice items or data from content providers to gain insight on mastery or progress and make adjustments to ongoing instruction or student activities. Summative assessments, which are used at the end of units or courses and often include assessments of multiple, cumulatively gained skills or content knowledge. Summative assessment is used to evaluate student learning and mastery at the end of an instructional unit. Summative assessments often asses multiple objectives and standards that have been taught over a period of time. Some examples of these assessments include cumulative quizzes, end-of-unit assessments, and end-of-chapter assessments. Summative assessments are usually provided after instruction over a few weeks, months, or at the end of the year and typically help to evaluate the overall effectiveness of a given curriculum, program, or intervention approach. Interim assessments, which are administered to assess pace of learning. Interim assessment is a form of assessment that educators use to evaluate where students are in their learning and to determine whether students are on track to perform well on future assessments such as standardized tests or end-of-course exams. Interim assessments are administered periodically during a course or school year, usually every six or eight weeks. 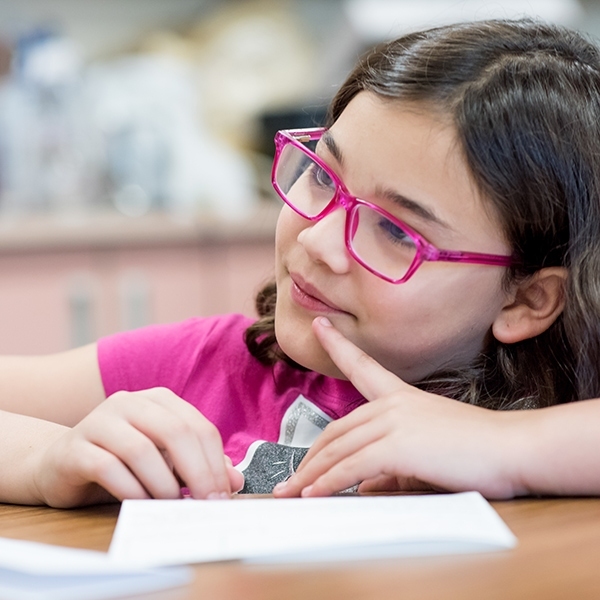 Examples of interim assessments include nationally normed resources like the MAP test or Performance Series, or more locally created “benchmark assessments” that compare mastery of skills across classrooms and schools. End-of-year assessments, which are particular types of summative assessments administered after instruction to assess how well students mastered expected skills or content. End-of-year assessments are mainly designed to estimate a students’ growth in knowledge and skills from one year to the next, to identify students who are academically at-risk or ahead, and sometimes to evaluate students’ progress against national norms. So, how are these assessments used together in a classroom? Each of these assessment types plays a different role. 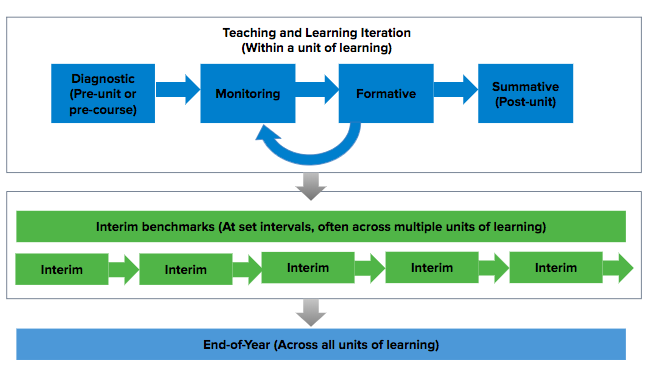 TLA found that great teachers make opportunities to embed various assessments throughout the learning cycle, iteratively and transparently, to triangulate the data emerging and connect the learnings to instructional actions. The chart below shows how they work together, in concert, to help educators make good decisions to support student learning. What about education technology’s impact on assessment and classroom data? Education technology has offered numerous new tools and opportunities for real-time student data to flow into the hands of teachers – each day, and through each of the six assessment types described above. Given this, it can, and indeed has already, dramatically changed how students are being assessed (often in more timely and digital fashions). Further, given the pace of data creation and the number of sources, it has also altered how teachers are looking at data to inform their instruction. The challenge we face is to find a way to tap into these powerful tools without overwhelming our teachers in a daily data deluge. It is critical to focus on the right data from the right assessments at the right time to help inform learning. We’ll be exploring this idea further in future posts in this series. 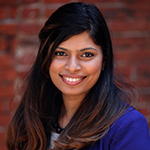 Nithi Thomas is an Associate Partner of The Learning Accelerator and an expert in school design, implementation, professional development, and coaching in new learning models.